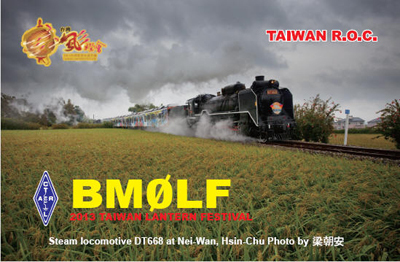 BV2013LF、BM0LF- 2013 Taiwan Lantern Festival Special Event Station. 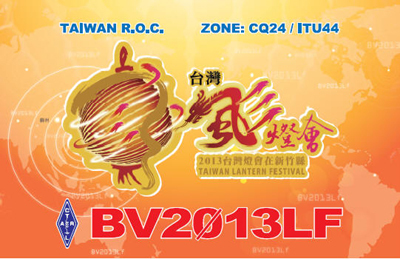 To celebrate the 2013 Taiwan Lantern Festival being held in Hsinchu, Taiwan during the 2013 Lunar New Year, Taiwan’s National Communications Commission issued special call signs BV2013LF and BM0LF on September 27, 2012. 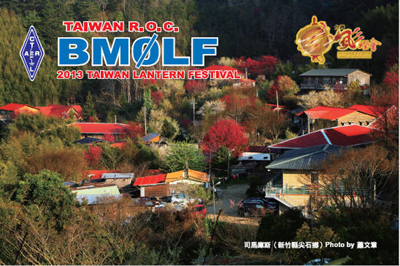 BV2013LF and BM0LF are to be QRV from October 1, 2012 to March 10, 2013. 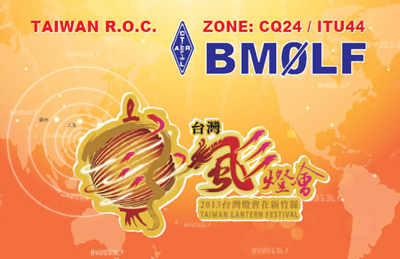 Licensed amateur radio operators and enthusiasts from all over the country as well as licensed foreign amateur radio operators resident in Taiwan are welcome to take part in these special event stations. 1.Directed by: Tourism Bureau, MOTC & National Communications Commission (NCC). 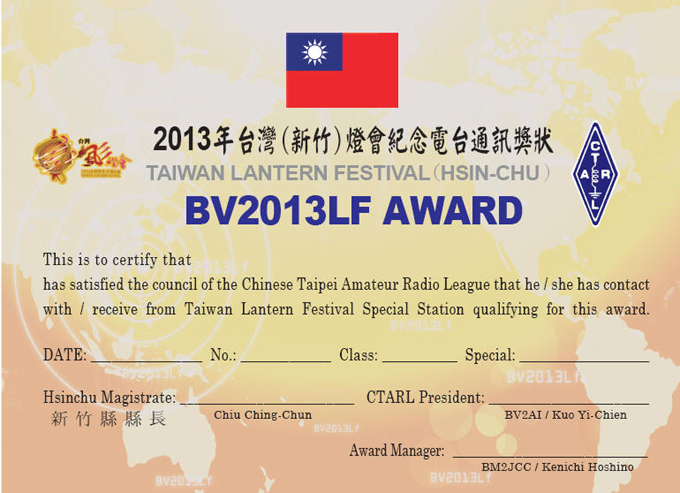 3.Co-organizer: Chinese Taipei Amateur Radio League (CTARL). 7.Operating modes: phone, CW, and digital. 8-2.Special event station logs will be e-mailed monthly to BM2JCC at bm2jcc@gmail.com to build a unified database for processing QSL card requests. 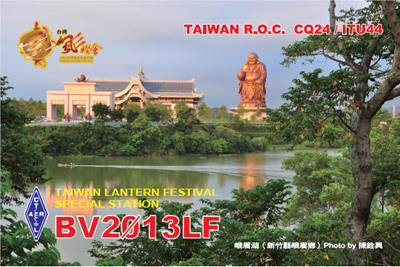 8-3.2013 Taiwan Lantern Festival Station QSL cards will be issued by BM2JCC based on compiled and unified log data. All licensed radio amateurs and all SWLs worldwide may apply for the award. Application form and QSO/reception log suffice; QSL cards/copies unnecessary. Provide in log the date, time (UTC), frequency and mode for each QSO/reception. 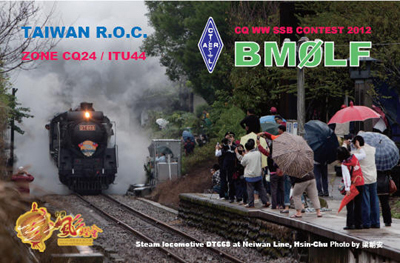 All QSOs/receptions must be between October 1, 2012 and March 10, 2013. Applications accepted between January 1, 2013 and May 31, 2013. (Limited edition of 500 awards issues). Platinum: 25 or more points. Gold: 15 or more points. 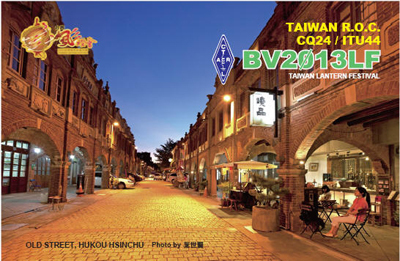 Silver: 7 or more points and should include QSOs/reception with/of both BV2013LF and BM0LF. 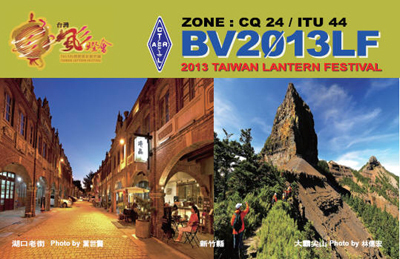 Bronze: 2 or more points and should include QSOs/reception with/of both BV2013LF and BM0LF. Maximum of two applications per person. Application forms should be downloaded from the website.